For unbelievable speed and hair-raising action, there is no better sport than Podracing. At the Boonta Eve race, Ody Mandrell's luck runs out during a pit stop when a pit droid gets sucked into his massive engine and shot out the back. 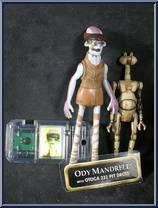 Contribute pictures, update details or suggest corrections for Ody Mandrell & Pit Droid. Write a review about Ody Mandrell & Pit Droid.